Here Kitty, Kitty - Where Are You? He's safe at home with a PetSafe Underground Cat Fence - the First and Only Underground Cat Fence. Through years of rigorous research and testing PetSafe developed a safe and reliable underground fence made just for your cat. Using Nano technology, PetSafe developed a cat fence collar that fits your cat and provides the appropriate amount of correction to keep him safe and in your yard. The collar has a special stretch section for your cat's safety so you won't have to worry if he gets "hung up" on something. Safe and Effective for all cats and dogs 6 pounds and up. 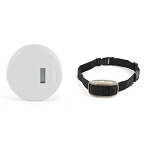 Features the PetSafe Premium Cat Fence Collar with Four Levels of Adjustable Correction. This Cat Fence Kit includes everything you need to contain one pet in a yard up to 1/3 acre. With additional wire and flags and cat fence collars, you can enclose up to 25 acres in size and contain an unlimited number of pets. We adopted an older kitten from a no-kill shelter. Our little guy had a docked ear - we didn't know what it meant at the time and they neglected to mention it means he at one point had been feral and living outside in a cared-for colony. For whatever reason, that did not continue and he was put up for adoption with his two brothers. Upon adjustment (and he is the best cat ever) he watched as our dog went outside and would just HOWL at the door wanting to go too. He then would bomb the door whenever it opened trying to bust out - and we would all run out to catch him. Not fun. With neighbor dogs, coyotes and a busy street nearby, we couldn't risk just letting him run. Tried to keep him in the backyard with just the fence (jumps right over it). Tried the harness and leash (a joke). Tried the electric fence (vet recommended it) - problem solved!!!! Easy to install, my husband and I did it in a day (about a 3/4 acre - back and front), put all the little flags around and had the cat stay in the backyard first (supervised of course), we tried it with the leash and harness like recommended but that was difficult, the best way was for him to figure it out. Unlike a dog that takes weeks - he picked it up in a couple days. We did try the lowest setting first and he didn't seem to notice the shock at all. Turned it up to 4 - that did the trick. I'm writing this in my kitchen watching my happy orange cat chase leaves and run around in the safety of our yard. We have had this for a few weeks and have encountered zero bust-throughs. I would recommend this to anyone. Excellent product and fantastic solution. Everyone here is happy - most of all my sweet cat. This system really does seem to work. I purchased it because folks in our community get really uptight about pets having free reign of the neighborhood. Took about two 8-hours days to install on a 1-acre lot, but the directions were extremely easy to follow and everything was very well explained. Training has taken a bit longer with my cat than the 30-day plan indicated in the manual. We're on to 3 months, and finally getting to the last stage. A few zaps it all it seems to have taken to convince her to stay inside the barrier, but she does still test the limits on occasion. However, my patience seems to be paying off. I don't keep the collar on my cat full time, but when she wants to go outside now, she runs to the spot where I store her collar and begs me to put it on--perfect association that the collar means outside time, which means fun time for her. After our most adventurous guy spent 6 days and nights locked in the neighbors garage we decided to try the in-ground cat fence. We installed it along a 4 ft chain link fence, top and bottom. It worked as advertised on the smart guy. After about three encounters with the shock he gives it a wide birth. Hard head however met the challange. After removing 3 limbs on thetree by the house and moving the bottom wire in from the fence about 4 ft, and turning the collar to 5 (Max), he figured out it would be much better to stay in the yard. However, he still checks it out just in case he missed something. We can breath easier now and they can go outside again. After my husband figured out how to install it he was able to get it installed quickly and easily. It works great. Much cheaper than other systems and works great!! We've had it installed for about a month now with no problems. It did not keep my cat from running over the lines. I really think that this product would work on a normal cat, but my cat is a siamese cat which is very stubborn. It didn't matter how much I turned it up, he would resist. I sent it back a week ago and am waiting for the my reimbursement. "I had tried everything to keep my cats from jumping up on my patio railing and roaming throughout my condo complex. Unfortunately, they discovered the joys of freedom when the complex was painted and barriers were taken down. We have many coyotes in the neighborhood, which was one of my big worries. My cats are now completely secure because of the ""electronic fence"" I bought from PetSafe. It was amusing to see their first reactions to a ""correction"". I hadn't seen one of my cats move that fast in years! This system REALLY works -- and is completely safe. It's also very easy to install." The best money I've ever spent on a cat! Having lost two manx cats in three years to coyotes, I was very upset to think I couldn't own a cat here. The cats wouldn't stay in the yard. I finally adopted another one, and never let him run free to do what cats do. Poor guy had to wear a harness and be tethered whenever he was out, which was pretty sad. I found this product, and am I glad! I installed it on our 1/3 acre lot in about 3 hours, which was very easy to do. "Bob" learned very quickly, when the collar beeps, go the other way. I use this fence for my 5 pound Morkie dogs. They love their new found freedom and learned very fast where the line was. I could shut off their collars and they still wouldn't leave the yard. This fence gave me peace of mind. Product worked just like you described! We purchased the cat fence for our 10 pound dog. It works perfectly. We installed the fence ourselves and any questions we had, we called the company and they were very helpful. Would highly recommend this product for cats or small dogs. My cat loves to be out of doors and this lets him have what he wants without his going over the fence. "First -PetSafe PetSafe Underground Cat Fence for self installation was one quarter the price of another brand for self installation in Toronto Canada. Second - It works as long as the battery is good. I have three stubborn,smart Bengals that challenge the system every time they go out and if we forget to turn on the collar or the battery is dead they go out on the town. One boy we have had to turn his collar up to #5 so he doesn't just run through the signal. I hate to do this as that shock makes me jump and scream but it is the only way to keep him in the yard. Right as soon as he hears the warning now he retreats but he has to challenge it every time he goes out in the back yard to see if it is on this time. Third - We had the transmitter die within a month of installing it but we were sent a replacement free of charge promptly. Fourth - As regards installation we installed it on the perimeter of our back yard on the wooden fence near the top and looped back half way down. The wire is a little flimsy and I will probably end up replacing it with some # 12 stranded RW90. I broke it in several places while stapling it on but marrettes and dielectric grease are holding for now. Fifth - The cats adjusted to the collars quickly and with less fuss than I thought.The batteries are expensive here and seem to last about a month even with them turned off when not in use. Sixth - We MUST take the collars off as the cats enter the house so they don't get zapped while inside the house in certain rooms. The signal travels just fine though the brick walls." Best customer service ever, even though this didn't work with my particular cat, it's still worth it to try it with yours. This product unfortunately did not work with my cat, but he is 13 years old, and extremely clever. He got outside of the fence when training, and it took myself, my SO, and a friend to track him down, and get him back inside. After that incident of him getting loose, I didn't want to risk further training, because I feared him getting out again, and me not being able to find him this time. I'm going to be getting him an outdoor enclosure instead. However, there is nothing to lose with this product. If you find it doesn't work with your cat, the company will give you a refund, and there are no crazy hoops to jump threw either. This is the best customer service I have ever experienced. So if this product does work for your cat, fantastic! If your kitty is like mine, and finds his way out, you get your money back. Shipping was quick for me, set up was easy, and the customer service was excellent. Thank you for this product. I have hawks that have taken neighbor cats so I didn't want my kitten going out.The problem is I have two labs that are indoor/outdoor and very use to a doggy door. I bought an expensive automatic door that the dogs could open with a charm on their colllar. First the door would get stuck then the kitten figured out how to go out with them. I was going crazy tring to keep him in when I saw this product. 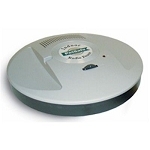 It works great I already had a big throw rug by the doggy door so I ran the wire around under it and it works great. The dogs aren't botthered and the cat can't go out. I am finally relaxed and I no longer hate the hawks. Q: Will this work for both cats and dogs? Yes, the cat collar can be used on small breed dogs as well as cats. 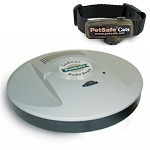 We also have sell a variety of Pet Safe dog collars that will work with the Cat Fence. Q: Does the wire have to be enclosed in any kind of piping before being buried? ex. Pvc piping Also this sounds like a great idea to keep my pets in, what about something to keep other kritters out? Do you recommend anything? The wire does not have to be buried in piping. You can either bury just the wire itself or you can run the wire thru PVC piping. These systems are meant to keep your pets contained not keep other animals out. Q: If i run the wire above ground along my 4 ft split rail fence would it harm birds or squirrels that may com in contact with it? Thats a good question. No, it will not harm any animals that come in contact with the wire. The wire broadcasts a radio signal only, it is not a "hot" wire. Q: We have an 8 ft block wall around 2 sides of our home - and the back is a wrought iron fence lined with critter fencing. Our big boy cat had been very good, but discovered the top of the wall (a flat spot) and now goes over and comes back. 1) Would we attached to the top of the wall? or partway up to prevent the jump? And 2) would we just keep going on top of the wire fence to the other side - so it is continuous? An 8ft wall is pretty high so you would want to bury the wire either at the base of the wall or attach it approx 2-3 ft up on the wall off the ground. The dial on the transmitter adjusts the boundary width and the max you can turn it up to is about 10 ft. So having it on the very top will make it difficult to set a boundary. If you bury the wire at the base or attach it a few feet up you can adjust the boundary to around 4-6 feet and that will keep the cat that far away from the wall. Yes, you have to keep a continual loop around the yard. Q: Does the shock or vibration hurt the cat? Thats a good question. The shock or correction is meant to deter the dog or cat. It's very similar to walking across the carpet and then touching a door knob. The cat collar does not have a vibration. You can adjust the correction levels on the collar: Level 1 is a tone only and the correction levels are 2-5. Q: how deep do you have to bury the wire? The wire needs to be buried only an inch or two deep, just enough so it is out of the way from the lawnmower or people tripping over it. You can also use our pet fence staples to hold down the wire and then you do not have to bury it at all. Please see https://www.radiofence.com/pet-fence-staples for more information. 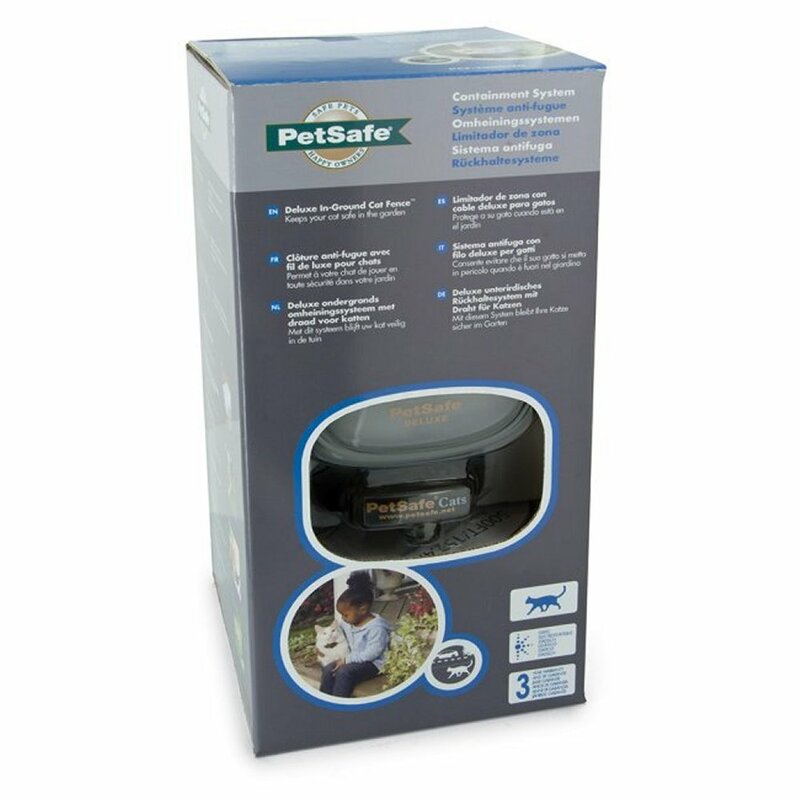 A: The PetSafe Deluxe In-Ground Cat Fence has a One Year Warranty. If anything in the system fails in the first year, it will be replaced at no charge. Q: I need two collars because I have two cats? Is this possible? You can add a second collar for your other cat. Actually, you can have an unlimited number of pets on the fence as long as each one has its own collar. 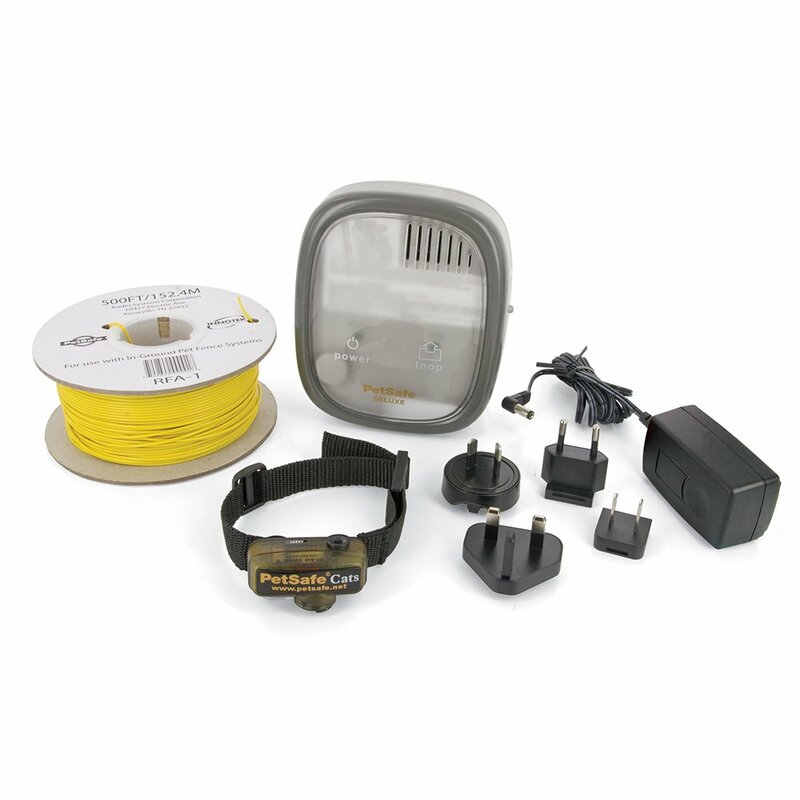 Q: Can your product the "TabCat Tracking Collar and Cat Locator" be used with the underground cat fence containment system? A: No, the TabCat is a stand alone product that does not work alongside any of the containment systems. Q: WILL THIS kit cover this area 100x90 backyard? Yes, you can fence in up to 25 acres with this system.